[Clement] and his friends were going on a long bike tour and needed a way to carry their gear along with them. They set to work and managed to build this cargo trailer from mostly reused materials. 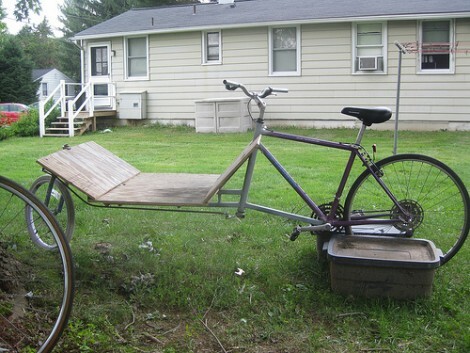 The only part of this trailer that is reused junk is the connection mechanism that lets you attach it to just about any bike. That was made (presumably in a machine shop) to act as a removable pipe clamp, making it pretty quick to swap between different bikes. It has a universal joint welded to it so that the angle of the seat post won’t affect how the trailer rides. A goose neck keeps the trailer far enough back to avoid getting in the way of the rear wheel. The mesh basket was made from parts of an old industrial machine. The rear wheel is attached with a swing-arm that has what looks like a rubber bumper to act as a shock absorber. But if you want to make sure a big bump doesn’t send your luggage flying, [Clement] included a picture at the bottom of his post showing a much nicer spring shock on a different bike trailer. 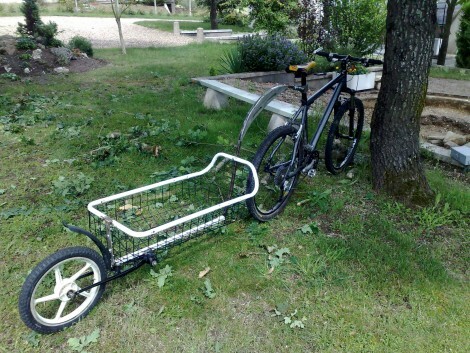 If you’re confused by the title of this post you must have missed the cargo bike that was recently featured.